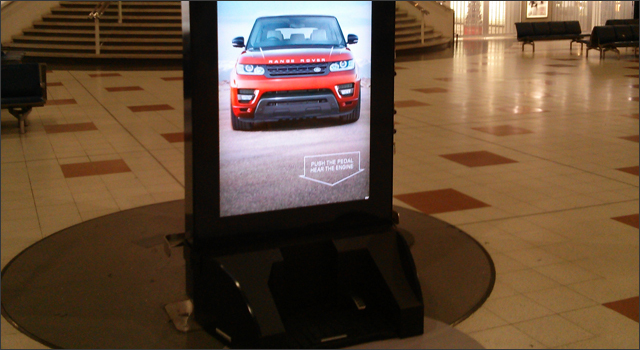 Passengers heading to their flights at Gatwick, Manchester and Stansted Airports were able to stop for a minute and experience the sound of the new Range Rover Sport, thanks to an interactive OOH campaign created by RKCR/Y&R. An accelerator pedal was added to the display, that when pressed brought the sound of the Range Rover’s new 5.0 litre supercharged engine to life. The display used directional sound so that only the person pushing the accelerator pedal would hear the sounds of the revving engine. Production was handled by Grand Visual with Curb Media providing the audio technology.